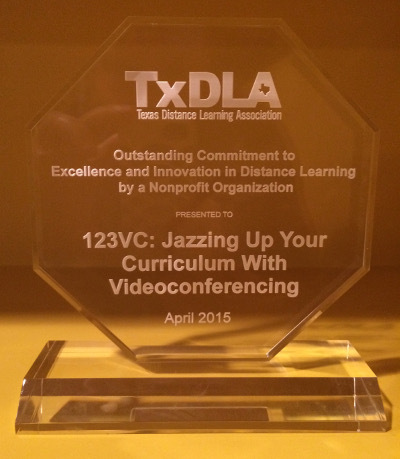 I’m so excited to announce that 123VC Jazz is the recipient of the 2015 TxDLA Outstanding Commitment to Excellence and innovation in Distance Learning by a Nonprofit award! It is a great honor after 10 years. 123VC Jazz is one of my most proud accomplishments. Especially because it has always been such a truly collaborative group effort. 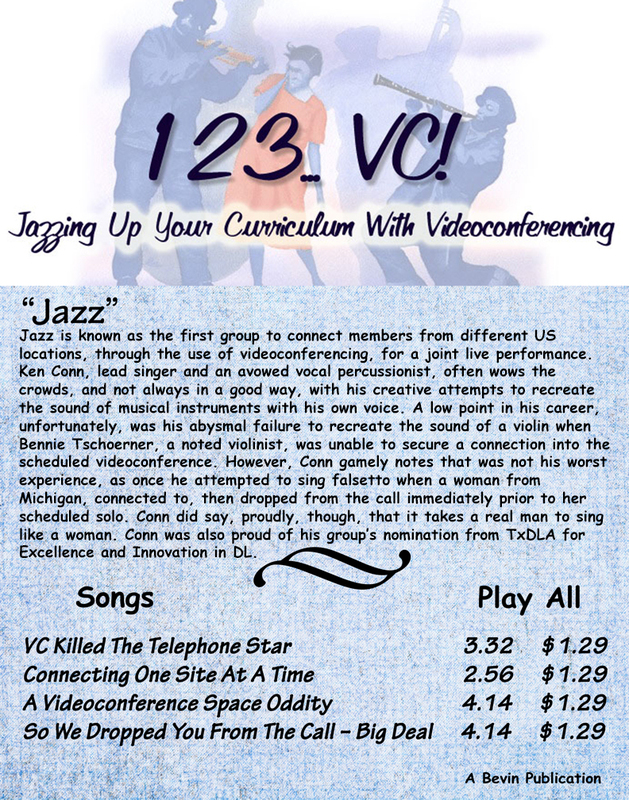 123VC: Jazzing Up Your Curriculum With Videoconferencing, fondly called “Jazz” by past participants and facilitators alike, is a grass roots collaboration that has been developed, prepared, coordinated, and facilitated by volunteers since its inception in 2005. The goal that fuels this organization is to increase the use of interactive videoconferencing in K12 education through experiencing it in a purposeful and engaging manner as well as active and guided reflection. The session is delivered from multiple sites simultaneously that connect through videoconference and web 2.0 tools for a variety of meaningful activities. Over time, the workshop has consistently evolved to include various site/lead facilitators with K12 curriculum infused videoconferencing continuing to be the focus. More detailed information can be reviewed at the 123VC website, http://123vc.pbworks.com/, which includes a link to past blogs, pictures, created projects, and the positive evaluation results of the participants from 2005 – 2014. In 2005, 123VC: Jazzing Up Your Curriculum With Videoconferencing originated from a simple request: Bennie Tschoerner, retired Technology Director at Paris ISD, approached Ken Conn, then Distance Learning Coordinator with Lamar Consolidated ISD, to facilitate a videoconferencing focused workshop in his district. This transformed into a larger idea of the two districts collaborating together on the workshop with much of the initial planning actually taking place at a table in the hallway at the end of the 2005 TxDLA conference in Fort Worth. Janine Lim, at the time a K12 videoconferencing leader from Michigan, also joined the original group as a third site after being approached to participate as a guest presenter during the workshop. The workshop is designed so the participants can be quickly immersed in videoconferencing to experience various formats and interactive content providers, reflect from a student and teacher perspective, and partner with a small group of educators across sites to develop a project that can be implemented back at their local sites. At the same time there is a significant amount of planning and collaboration occurring among the various site facilitators in order to prepare, coordinate, and facilitate the session. It is a videoconferencing workshop for participants that is synchronously occurring during a videoconferencing workshop for the facilitators. The true innovation of this organization over the years comes from the consistent collaboration, reflection, and application of new approaches/ideas. The facilitators have changed over the past ten years and the content of the workshop has continually taken the feedback from both participants and facilitators into consideration. The content, processes, and procedures have evolved to incorporate the lessons learned over time. “Jazz” is a unique organization in many different ways that is truly organic and will continue to provide a positive impact to the videoconferencing community. Finally, the poster advertising the award nominee at TxDLA. Congratulations, Ken, on keeping Jazz alive for so many years of amazing professional development for teachers! To learn more about Jazz, review my past posts about the Jazz workshop.